Motherwell won at home for the first time in Mark McGhee's second spell in charge, and their first since the end of September. 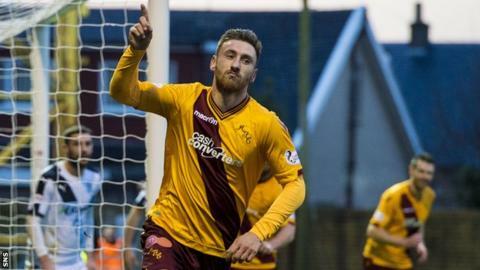 Scott McDonald and Louis Moult both found the net in the first half, McDonald sliding the ball past Scott Bain while Moult supplied the decisive header to convert Josh Law's corner. Substitute Gary Harkins' goal inspired Dundee in their bid to fight back. But in the end Stephen Pearson's late goal put victory beyond doubt. Dundee remain without a win since they beat Motherwell at Dens Park at the start of October, and they were behind after only five minutes. Motherwell's opening goal owed everything to the understanding between Pearson and McDonald. Pearson at the edge of the box timed his through-pass well to allow McDonald to slip by the Dundee defence. Without breaking stride he slid the ball beyond goalkeeper Bain, leaving the Dundee defence to appeal unsuccessfully for offside. McDonald turned supplier to set-up Pearson, but his shot was turned away for a corner by Bain. Two minutes later Moult hit the post with a header. But he only had to wait two more minutes to score, deftly angling his header in at the post from Law's corner. Dundee had been looking for a fifth straight win against Motherwell but they found the Motherwell back four resolute, with debutant Ben Hall looking composed alongside Stephen McManus. The visitors introduced Harkins into the action and they were quickly rewarded when he converted Kane Hemmings' low cross; the shot taking a slight deflection to beat goalkeeper Connor Ripley. The game opened up as Motherwell sought a third goal, while Dundee looked sharper in their search for an equaliser. Greg Stewart was best placed twice for Dundee, but his normally reliable finishing skills deserted him. The game was settled as a contest when Pearson scored from close range, scoring from a tight angle in stoppage time. Match ends, Motherwell 3, Dundee 1. Second Half ends, Motherwell 3, Dundee 1. Substitution, Motherwell. Dylan Mackin replaces Louis Moult. Goal! Motherwell 3, Dundee 1. Stephen Pearson (Motherwell) right footed shot from the right side of the six yard box to the top right corner. Assisted by Louis Moult. Attempt saved. Gary Harkins (Dundee) right footed shot from the right side of the box is saved in the top centre of the goal. Louis Moult (Motherwell) wins a free kick in the attacking half. Foul by Stephen Pearson (Motherwell). Attempt missed. Louis Moult (Motherwell) header from the centre of the box is just a bit too high. Lionel Ainsworth (Motherwell) wins a free kick in the defensive half. Foul by Thomas Konrad (Dundee). Louis Moult (Motherwell) wins a free kick in the defensive half. Ben Hall (Motherwell) wins a free kick in the attacking half. Substitution, Motherwell. David Clarkson replaces Marvin Johnson. Attempt missed. Riccardo Calder (Dundee) right footed shot from outside the box is close, but misses to the right. Corner, Motherwell. Conceded by Gary Harkins. Attempt saved. Josh Law (Motherwell) right footed shot from outside the box is saved in the bottom right corner. Attempt missed. Greg Stewart (Dundee) header from the centre of the box is close, but misses to the right. Attempt missed. Greg Stewart (Dundee) right footed shot from outside the box is just a bit too high. Attempt saved. Marvin Johnson (Motherwell) left footed shot from the centre of the box is saved in the centre of the goal. Corner, Motherwell. Conceded by Paul McGowan. Goal! Motherwell 2, Dundee 1. Gary Harkins (Dundee) right footed shot from the centre of the box to the bottom left corner. Assisted by Kane Hemmings. Paul McGowan (Dundee) is shown the yellow card for a bad foul. Attempt saved. Kane Hemmings (Dundee) right footed shot from the centre of the box is saved in the bottom right corner. Attempt missed. Louis Moult (Motherwell) right footed shot from outside the box is just a bit too high. Substitution, Dundee. Riccardo Calder replaces Nicky Low. Substitution, Motherwell. Lionel Ainsworth replaces Scott McDonald. Attempt missed. Greg Stewart (Dundee) left footed shot from the right side of the box is close, but misses to the left. Attempt missed. Louis Moult (Motherwell) header from the left side of the six yard box is close, but misses to the left. Corner, Motherwell. Conceded by Paul McGinn. Attempt blocked. Gary Harkins (Dundee) right footed shot from outside the box is blocked. Scott McDonald (Motherwell) is shown the yellow card for a bad foul. Greg Stewart (Dundee) wins a free kick in the attacking half.